Popcorn cassia in a garden. The plant commonly known as popcorn cassia is a legume (family Fabaceae) from tropical central and eastern Africa that is common in disturbed areas, but it is also grown as an ornamental plant world-wide. 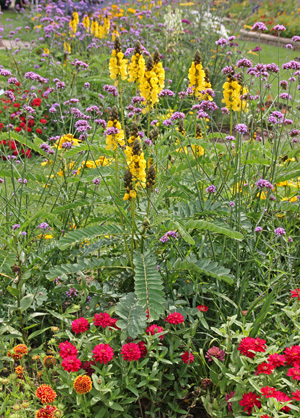 The species Senna didymobotrya has also been used as a cover crop or green manure crop in some locations. It was previously classified in the genus Cassia, and that has remained as part of its common name. The other part of the common name comes from the scent of the foliage when rubbed – often described as that of buttered popcorn, but other interpretations of the smell include the less appealing “mice” or “wet dog”. Although this tropical plant is only hardy in zones 9-11, because of its rapid growth and habit of flowering when small it is easily used as a seasonal annual in cool climates. Popcorn cassia is a semi-deciduous, multi-branching shrub or small tree that can grow up to 25 feet tall, but generally remains much shorter (6-10 feet tall). When grown as an annual it may only get a couple of feet tall. The pinnately compound leaves are bright green. The pinnately compound leaves can grow up to 18” long, although container-grown plants generally have smaller leaves. The 8-18 paired oval leaflets are up to 3 inches long, each with a mucronate apex. 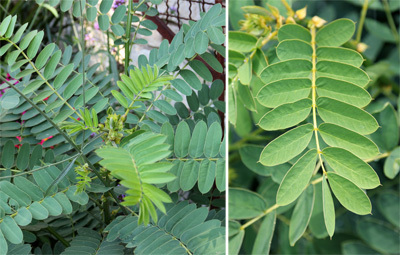 The bright green, leathery leaves and rachis are variably pubescent (covered with fine hairs which vary in density and length between individuals). This plant blooms from spring through fall (but most freely in late summer when temperatures are warm), with dense flower spikes up to one foot tall. The erect axillary racemes have 20-30 rounded flower buds. Each unopened bud is enclosed by a brownish green or black bract that opens to allow the five slightly unequal petals to emerge. These bright, buttery yellow petals are incurved at first, but later become more spreading. The ½ to 2 inch wide flowers have 10 stamens, usually with seven fertile ones with large anthers and three sterile staminodes. The flowers in each inflorescence open at the bottom first and open sequentially up the raceme. Supposedly the flowers smell like peanut butter, although the fragrance is quite subtle. The flowers open from the bottom of the spike upward (L), with the dark buds opening to reveal butter yellow petals (C) and the seed pods developing before the petals fall (R). Flowers are followed by typical legume-type fruits up to 5 inches long. Each flat brown pod contains up to 16 smooth, flattened, bean-like seeds with the pod depressed between the seeds when dry. Popcorn cassia produces typical legume-type pods (L and C) with small brown seeds inside (R). The large, compound leaves offer good contrast to many other plants. In the Midwestern garden popcorn cassia is used as an unusual accent plant with its bright yellow showy flowers contrasting with its striking black buds, for the tropical effect of its foliage, and for vertical interest with its tall flower spikes. Plant it among other annuals in the border, or as a specimen in a large container. In a mixed container it can function as the “thriller” or tall plant to contrast with other trailing or mid-sized filler plants. The large but feathery foliage contrasts nicely with other tropical with large leaves (such as bananas, elephant ears or castor bean) or anything with dark-colored leaves. 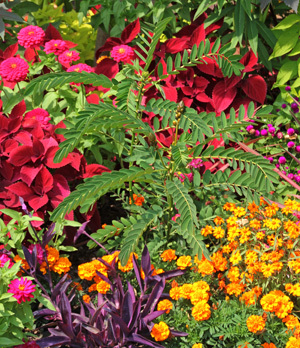 Try mixing it with pink cosmos and orange dahlias for a bright burst of color, or use it with yellow dahlias and snapdragons for a sophisticated monochromatic color scheme. Grow popcorn cassia in full sun in rich, moist soil. 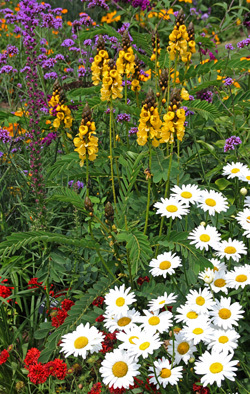 Senna didymobotrya grows best in full sun in rich, moist, well-drained soil. 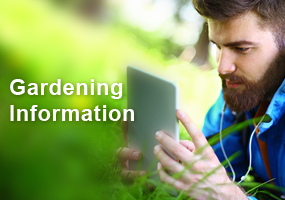 Provide with ample water and fertilize regularly to promote lush growth and flowering. As a tropical plant it will languish in cool weather, but will thrive in the heat and humidity of summer. Prune after flowering to keep more compact, but this will delay repeat blooming. It does not have any significant pests and is not favored by deer. Although it will tolerate light frost, if you want to try to keep this plant over the winter in a greenhouse or a bright window, try to bring it indoors when nighttime temperatures are in the high 30’s. Popcorn cassia can be grown from seed, but for use as an annual it is more typically purchased as a rooted cutting. 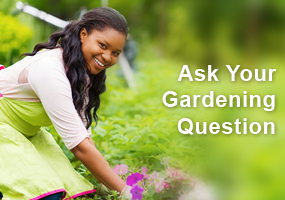 Seed will germinate more readily if soaked in water for 24 hours or scarified mechanically or in boiling water. Sow shallowly in February or March. Wait until all danger of frost has passed before planting outdoors, either in containers or in the ground (at the same time you would put tomatoes outside). Place plants about 2 feet apart. Grew mine from seed started in greenhouse last spring. It was so lush and healthy, grew to at least 12 feet by August. It never bloomed once though, so I attempted to overwinter. I’ve never grown it from seed, I’m wondering if my soil is high in nitrogen, or are there any other ideas why it didn’t bloom? The foliage is so unique and it looked so great and healthy I’d love to grow it again this year–but hopefully with some blooms. HOW DO YOU TAKE CARE OF THE POP CORN PLANT IN WINTER IN MICH? You have to bring it inside! If I bring this inside over winter, what kind of light does it favor? I tried last year to bring plant in. It needs alot of light. You may need to put a grow lamp on it, also needs warmth so maybe q really warm spot away from windows. Grow matt maybe will help.. good luck….let me know how it turns out in spring. My popcorn plant looked good yesterday, though I saw signs that something had been digging near it. This evening I noticed that part way up the stems, some of the leaves have been stripped off…..none laying on the ground. I think something has eaten them! Could a rabbit do that? A trellis is behind it. Some of my pots on the deck have been dug around in (first time ever)….and last night we saw a rabbit on the deck. It’s a host plant for the cloudless sulphur caterpillar/butterfly. Need some help!!! Last year our first time popcorn plant grew almost 6 feet tall but only branched once. We got one again. So far 2 1/2 feet and no branching out. Should I snip the top and see if it branches out?? My popcorn plants top sets of leaves are curling( not closing as I’ve seen it do nightly). Otherwise it looks healthy. Just wondering if this is something normal or a sign it’s dying? It gets plenty of water and sun. I just purchased a potted cassia didymobotrya from a local greenhouse here in southeastern PA. I have it outside in its pot where it only gets the morning sun till about noon. The stalk is not growing straight up and now the leaves on the stems at the top of the plant are curling together. What does this plant need that it is not getting causing it to behave this way? I live in western PA and also planted from a smaller potted plant. I chose to put mine in the ground in full sun, has 5 branches all reaching straight up! And is amazingly 5’ wide and nearly 5’ tall! I am completely amazed. I think by moving your plant into full sun it will helpmit dramatically! The tad said 3feet, mine are over the roof of my house,I cut them practically to the ground,and they get just as big,love the smell of it and the flowers,but the size wasn’t what I expected. I got one of these this summer and it did great outside but did not flower. I brought it in and all the leaves dropped off. They then started to regrow but the stem has black spots on it and all the new growth is drying up and falling off. I have googled and cannot find any diseases related to this plant. HELP!! I can’t keep the ants away, I kill them and more come back and they are getting in all the petals of the new bud. I don’t know how to get rid of them permanently. Will the ants ruin the blooms? I’ve had my plant out all summer. No flowers but it grew. Brought it inside now the leaves are turning yellow and falling off. Did you ever get a response as to why this happened or what can be done? If these are poisonous to “pets”, ….would they also be poisonous to deer ?, wild turkey ? You should be planting natives on an empty parcel in God’s country..milkweed, lupines, litaris..
Read other sites. These can be invasive. Don’t try to naturalize. Don’t distribute seeds. Deer doesnt like the plant.. I have never had deer touch it.. I grown them for 3 years now in Michigan. This year I put them in giant pots on my deck. They grew three to four foot tall it’s Nov. With the frost just starting they’re going under. I clip the seed pods off I have about a dozen or more brought them inside to dry and will harvest the seeds from them and start them in the spring we’ll see what happens. 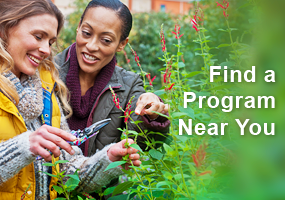 Have you tried sprouting them yet? I didn’t remember to harvest my seeds last year. Got one this year and just put it in a screened in porch and will be bringing it into the house for the winter. Only have east and west windows in my house so which is best? Also do I need to leave the spikes alone or trim them down for the winter….Thank you…..
Has anyone successful grown cutting? If yes, did you cut the mail stalk or a branch? To take a cutting And start a new plant, how do I take a cutting? When do the seed pods form?? Just brought it in for winter. They form on large arms protruding from under flowers, you should have pods if you have flower heads, I do. I love this plant so I brought it in hoping to winter it over in front my patio window, just 2 feet from where it grew beautifully all summer. Sadly it Is dropping all its flowers and leaves are turning yellow. Its near the heat vent but its not right on it, our Minnesota winters are harsh but not yet. Whats going on?? Mine is doing same, and it was so cheap from Amish I may just take back out of house and use pods and seeds from them for next springs crop, it’s a messy plant right now and only been in house four days! That’s exactly how close I placed my plant inside as well and it’s just a mess! I work at a garden center and this is one of the plants that people will ask about. It is always in the wish book for the next year. I did not realize that some people think it smells like mice or wet dog. I also did not know that it can grow to 25 feet tall. I bought this plant in late spring and the directions say it will grow to about 8 feet tall. Also, it says it smells like ‘buttered Popcorn” . It really does! I planted it in direct sunlight and it’s already about 5 feet tall. I was checking to see how it tolerates winter, so now I will be digging it back up and bringing it indoors. I certainly hope it doesn’t smell like wet dog! Are these plants “pet friendly”? Toxic to cats and dogs? Can it be directed/trained to grow as a tree? Do I remove the many new shoots coming from the base? It is in a pot on my terrace. Or can these shoots be rooted on ? Leaving shoots from the base will make for a fuller plant. I doubt they could be rooted, but you could try. Ours looks like a vine. The trunk isnt getting any bigger but its growing like a weed! It doesnt seem to get any taller, just wider. We have to stake it up in order to keep it from falling over. I deadhead it but that’s the extent of pruning. Any ideas or suggestions why? Should I build a terrace for it? I have 6 of them and they are doing about the same as yours. At my local nursery where I got them they grew to be about the look of a 3′ tall and 4-5′ wide bush without support needed (last year). Mine appear to be headed down the same path but as of this date have not bloomed yet. Needs full sun and not so much water, when leaves curl, I water. Mine is 5 ft high now and I purchased in late May as a small plant from Amish. I did need to stake as it bent a bit as it grew taller. I read does better as an annual against a building, mine grew in a large planter. If I take it out of my outside pot and transplant to a smaller pot to bring indoors can I then re pot to the larger outdoor pot in the spring. I don’t have a greenhouse. How do I protect it from frost/snow? You have to bring it indoors. I have kept one for three years now in my greenhouse over the winters.